A page from Hunches in Bunches, by Dr. Seuss. Copyright 1982 by Dr. Seuss Enterprises. 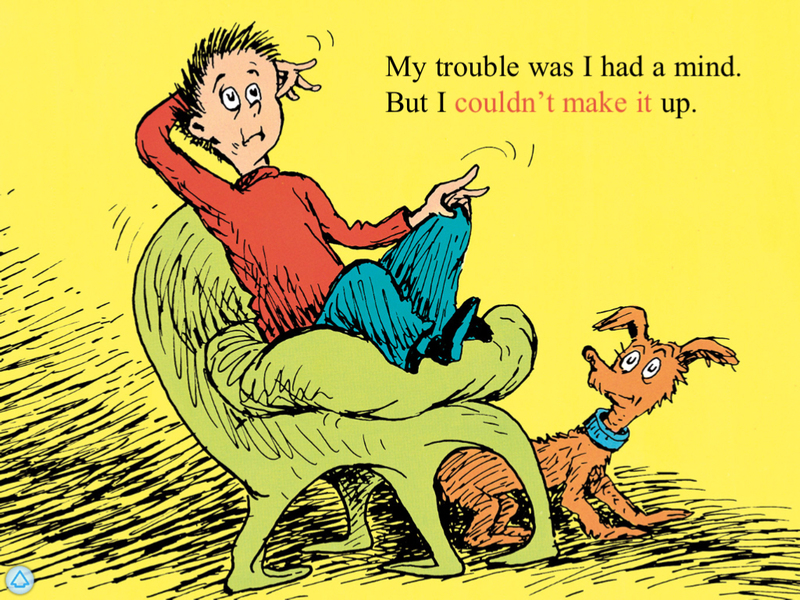 No lie–this has been one of my favorite books since I was a small child. In my last column for NCR, I wrote about my somewhat surprising desire to find a church home in my new city. I said there that I’m looking for a way to connect with people socially and politically, but there is a third aspect of the church search for which I ran out of room. I’m looking for spiritual fulfillment, too. At this point in my move and in my life, my strongest desire regarding spirituality is for guidance. I’m still defining what this means for me. In the past, being “guided” by the Holy Spirit has meant following God’s perfect plan for my life to the letter, without so much as a toe straying from the predestined path. To discern the path took immense effort–prayer, sermons, advice from other Christians, fasting, listening for God’s voice, reading the Bible for passages that mysteriously illuminated themselves and spoke directly to my situation, pacing the floor for several of the last hours before decision deadline when a different answer arrived from all of those sources, and being dissatisfied with whatever the outcome of the decision was, thereby convincing myself that the decision was wrong. But even if I complete them all, they are but one-year goals. When people ask me how long my MFA program is and what my plans are after it’s over, I can’t answer that question. I plan to write books and hope that people buy them; every writer does. Do I also plan to be a technical writer, teacher or housewife to a rich spouse in order to pay the bills while I write and pursue business ownership part-time? I don’t dream about most of those choices. I know I want to have published a book through a traditional publishing house by 2020. But “whatever it takes to get there,” or “if the Lord say the same,” don’t give me as much comfort as a concrete answer to, “What should I do?” would. At my age, I don’t have time to be directionless. Perfection in any aspect of life is just not possible- but it is so appealing to try. I struggle with knowing the “right” direction also- can’t say I have any answers, but will say a prayer for you! Thanks for your prayer! I truly appreciate it. I think the best wisdom is the one that says :Pilgrim, there is no path. the path is made by walking. Being wholly yourself, alive and fulfilled in every way, is the best possible way to thank the one from whom you sprung. Strong and bold – you delight me. If I was God (oh I wish, sometimes) I would puff up with pride and pleasure whenever I looked at you. Go for it! Thank you, Pauline. Your message is so very comforting. I think you are a gifted writer, and you have fabulous spiritual insight. You are definitely blessed to write, and I would gladly buy your books. Bless you! I’m working hard to have a book published soon.